The French Open is the pinnacle of the clay court season and notoriously the Grand Slam that has been the most difficult to win (unless your name is Chris Evert!) Otherwise known as Roland Garros, the Open has produced 25 female winners since the 1970’s. Many French Open finals are blowouts (remember Steffi Graf’s double-bagel 6-0 6-0 win over Natalia Zvereva in 1988? ), but there have also been several scintillating championship matches. As clay is a relatively slow surface to play on, the balls bounce with less pace and rallies tend to be longer and more dramatic. These are the five French Open finals champions who persevered with determination and grit to win the most competitive women’s title matches. Top-seeded Steffi Graf had not dropped a set entering the final, but she was pushed to the limit by the Barcelona Bumblebee Aranxta Sanchez Vicario, who would win three French Open finals of her own. Graf needed just over three hours to claim the fifth of her six titles at Roland Garros, breaking Sanchez Vicario’s serve to end the match. By 1999, Graf’s game was in decline and she had dropped to the #6 seed. At age 18, Martina Hingis was the world #1 and seemed to be a heavy favorite. But her youth and inexperience came through when she protested a call in the second set, causing the crowd to loudly turn against her. She committed a breach of tennis etiquette by crossing the net to examine the mark, causing the crowd to start chanting Steffi’s name. Though she was up a set and a break, Hingis could not handle the jeering. She made things worse by resorting to an underhand serve at one point, resulting in more boos. Graf’s steady play won out as Hingis fell apart. 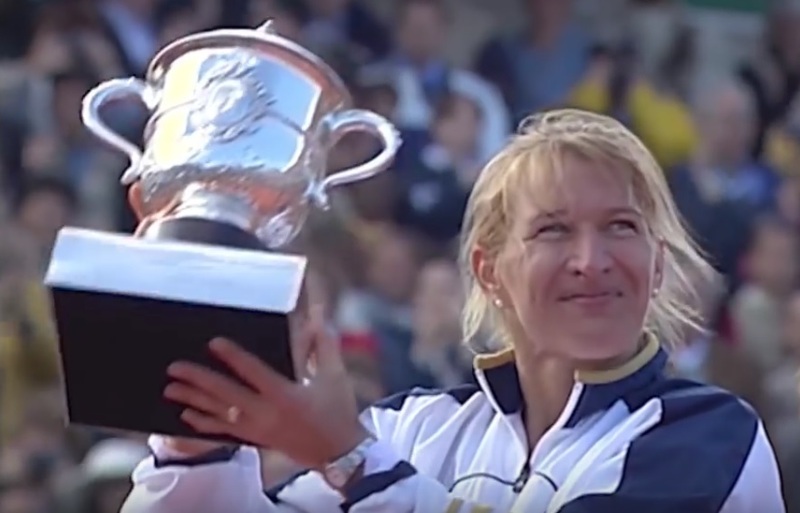 This remains one of the most infamous French Open finals in history, and it would be Graf’s last French Open match, as she retired months later. Out of the 80 matches these two tennis greats would play against each other, this was one of the most memorable. Coming off a loss to Navratilova in the 1984 final, Evert needed this win more than ever. The two players’ contrasting styles created a tense and exciting final that saw Evert break Navratilova’s serve in the final game with a brilliant backhand passing shot up the line to finish off a fantastic 7-5 finale. This final continued a tremendous comeback for Capriati, who had been a phenom at age 13 but saw her career interrupted by personal problems. Now 25, the fourth-seeded Capriati beat the rising star Clijsters, the #12 seed, with the longest final set in French Open history. The two exchanged some truly epic rallies at 10-10 in the final set before Capriati finally pulled it out. Monica Seles was at the peak of her game in 1992, rolling over the competition and seeming unstoppable. Graf gave her one of the toughest battles of her career, taking Seles to the limit in the final set. Graf saved four match points, but Seles ultimately prevailed to claim her third consecutive victory in the French Open finals and win the best women’s French Open final ever played.